ErgoLean AMP - The King For Everyday Fat Loss! In the past I have said that you should only use AMP three times a week. Well I was playing it safe and would now like to share with you some of what I have learned when taking it once to twice daily. If you have purchased ErgoLean AMP and looked at the label, or if you have read the promotional material regarding how to use it, you have noticed that my recommendation has traditionally been to use it no more than three times a week to avoid desensitization to its effects. On top of that, I have always emphasized the benefits of ErgoLean AMP as an energy product, and made less mention about its power as a fat burner and appetite suppression. Well, I am here to tell you now that after several months of receiving feedback from hundreds of users of ErgoLean AMP, and information I have deduced from further researching its properties, I have come to some new conclusions. These conclusions have made me change the way I recommend using the product. Several people I know (some in person, some from email) have taken AMP everyday, often twice a day, for the purpose of appetite suppression and fat loss. These people have reported phenomenal results, and none of them have commented on AMP losing its effectiveness over time. Yes, they have said they get a little more used to its stimulant effects but the appetite suppression and general energizing feelings have not waned for them over time! The interesting thing is that some of these people are those who could not tolerate ephedra due to its anxiety producing properties, and due to the terrible "crash" it produces when it starts to wear off. Did Ephedra Ever Give You A Symptom Of Anxiety? 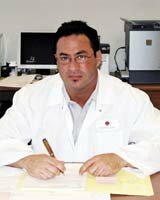 Regarding the people using ErgoLean AMP everyday for fat loss, I have seen some who take one pill a day (mostly women), one pill twice a day, two pills once a day, and two pills twice a day. One man that was doing two pills twice a day for a month, walked up to talk to me in the gym. I did not even recognize him! He told me how he was taking AMP and how great it worked for him. He was quite thankful towards me! What Are People Saying About ErgoLean Amp? Now, even if your goal is not weight loss but just pre-workout energy, taking AMP more than three times a week is not going to result in you building tolerance to its effectiveness. I know for a fact, because for many weeks I was taking it before every workout (I workout 5-6 times a week). It works the same practically every time for me. The only time it does not work is when I have not gotten enough sleep or am overstressed and distracted. However, caffeine and ephedrine never helped me on those days either, so that comes as no great shock. So my conclusion is: don&apos;t feel restricted to taking AMP only three times a week like I originally suggested. In retrospect, I was just being overcautious by saying that. Better safe than sorry though, right? & Head Chemist Of ErgoPharm. And if your goal is to lose weight and trim down, give AMP a try! Don&apos;t think AMP is just for energy and not for dieting. Quite the contrary - AMP is very likely the most powerful weight loss tool that you can purchase without a prescription. Hell, even with a prescription I don&apos;t think there are too many things as effective. What Do Our 100,000+ & Forum Members Think? Find out what our forum members think. Get real life logs and opinons from the experts. Learn More.